One of the things with kayaks is that they are large objects. As such you’ll need something to tow them around to and from where you’ll be going. The best kayak cart is your best bet when it comes to this. These carts are much cheaper than the full on racks or carriers that some people use. Plus, they’re just as effective. In addition, carts designed for towing kayaks work just as well for canoes and some other boats. Lastly, they’re often compact with sometimes the ability to fold down for easier storage. When looking for a reliable kart for your kayak, the products listed below are the ones we like most. Our research led us to these items. And if you want to learn more about them, please head on down further below to the reviews section. Click here to go and see which products are highly rated on Amazon.com. The Clipper Deluxe Universal Cart by Malone has an impressive weight capacity of 200 pounds. This amount it can hold and carry makes it great for transporting your kayak or even your canoe. This ensures that you can easily get to and from where you’re going without issues or hassles. It also lets you add keep some equipment on the water craft should you not have much room in your vehicle. We like this cart thanks to its durable frame. The structure is made of anodized aluminum that resists corrosion and contributes to its lighter weight. Overall the unit weighs just 9.3 pounds thanks to this. Another feature we like is that it is very compact. The frame is able to fold up and the wheels can be removed. This allows for it to be stowed inside your kayak for land transport. The device comes with 10 inch diameter airless tires. The fold down kickstand meanwhile, allows for easy loading. The padding also ensures that your kayak won’t be damaged in transport. The product includes tie down straps to keep your kayak firmly centered on the cart. This allows for effortless transport as you won’t have to support any weight. It measures 14 inches long, is 27 inches wide and 16 inches high. Another product we like for transporting your kayak is this canoe and kayak cart from TMS. This canoe and kayak dolly by TMS is a lightweight yet rugged cart. It comes with a nice weight capacity of 150 pounds. This is slightly less than the one that’s offered by the Malone utility cart above, but will work well with most small water crafts. This kayak trolley is made of anodized aluminum pipes. Also, there’s stainless steel that contributes to its durability. Together they give you something that can hold a good amount of weight, is compact and light in weight as well. The materials used allow it to weigh a scant 8.8 pounds. This boat carrier has a collapsible design that allows it to fold up and store compactly. The wheels do not come off however. But even at a diameter of 9.5 inches for the wheels, it does still allow for easy overall storage. The tires that come with the unit are inflatable. And, more importantly, have a rugged tread that makes for easier transport across sand or loose stones. This will probably be the terrain you’ll deal with a lot anyways. This cart also features a spring-loaded kickstand for easier loading. There are also two nylon straps that keep the cart from opening too wide. Finally, it comes with a 12 foot long tie down strap to keep you boat secure during transport. The Xpress Kayak Cart by Malone is specifically designed for standard style kayaks with scupper holes. So if you’re going to purchase this, make sure that your boat fits the specifications. This Xpress cart is made of a rugged anodized aluminum frame that adjusts from 6.5 inches to 16.5 inches. This gives you the versatility of adjusting for size to fit your craft. All thanks to the variable locking controls that are built into the device. This Malone kayak cart can support up to 200 pounds. 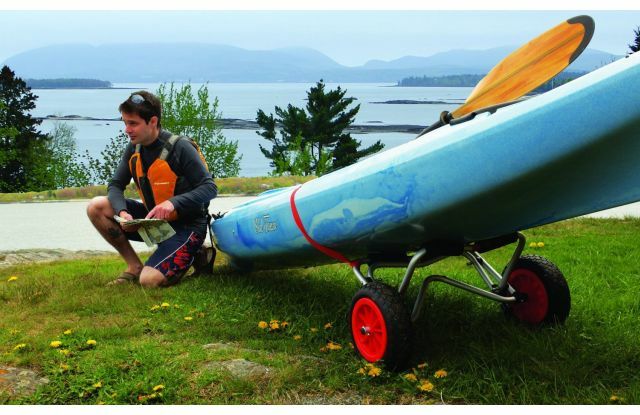 This weight capacity makes it a versatile choice for small or larger kayaks. The device features a durable 6 inch by 4 inch foam pad. This helps in that it provides protection to your kayak while in transport. This pad is removable should you want to do without it. The product also comes with Malone’s sturdy 10 inch diameter airless tires. The tires are equipped with rugged treads to make hauling your kayak across sand a breeze. One of its best features is that this cart does come with a lifetime warranty. Although with such durable construction and stainless steel hardware, you’ll likely not need it. This product is a trolley that can be used for canoes and kayaks alike. The C-TUG Kayak Cart features an eco-friendly construction as it’s made of composite materials. Unlike metal kayak carts, this cart will never rust or corrode. Yet, despite its deceptive appearance and light weight of only 9.3 pounds, it is able to support a massive 300 pounds. This allows you to easily use this cart for your kayak or canoe. This weight is also more than the capacity that’s often offered by similar kayak and canoe carts. This product comes with some bright color designs along the black colored exterior. It also features an expandable frame that allows it to easily adjust to your kayak and provide a secure fit. The C-Tug boat cart comes with wheels that are an innovative. They are designed to be puncture proof and airless as well. This is a new design that was introduced only recently. These wheels are 12.3 inches in diameter and wide enough to get across even soft sand. The product also comes with an 8 foot long tie down strap.